If you’re among the many businesses that are planning a spring or summer office move, then while your employees may be excited about what will unfold in the future, there’s still the aforementioned “dead of winter” to deal with. And that could mean that your work environment is dotted with a mix of space heaters: everything from futuristic infrared devices, to old fashioned appliances that might be more suitable for the Antiques Road Show. 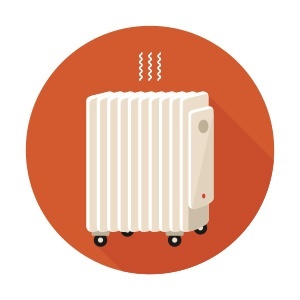 Only allow space heaters that are certified as safe by a nationally-recognized testing laboratory, such as UL (Underwriters Laboratory) and ETL (Intertek). Many older space heaters will NOT meet this standard. Check out Consumer Report’s space heater buying guide for more details. Never allow employees to put space heater on furniture, such as tables or workstations. The only safe place for a space heater is the floor. Ensure that space heaters are kept at least 3 feet away from all flammable materials, including papers, drapes and furniture. This is a difficult thing to do in an office environment -- and probably impossible in a cubicle or small office -- but it’s a rule that you can’t afford to let employees bend or break. Don’t let space heaters run throughout the day. 20-30 minutes at a time is sufficient. Even small space heaters require a surprising amount of power (which is why they’re notorious for blowing fuses when used in homes). Don’t let your environment turn into a space heater farm. Aside from the overload risk, your utility bills could skyrocket. Our advice? While it may not be what some of your shivering employees want to hear, the safest policy is to ban space heaters entirely. However, if that’s not an option, then the above tips can help you handle Old Man Winter for another season, while you look forward to moving into a new space in the near future that, hopefully among other benefits, has improved climate control and is more energy efficient. To learn more about planning for your office move – and other tips to optimize your current environment so that it’s more employee-friendly and productive – contact the Precision team today. Your consultation with us is free!